Today I'm going to do things a little differently. First you get to see the card, and then we will talk about all the gritty details of cutting your sheet of DSP up. Ready? Let's Go! 3) Turn your two stacked sheets so your cuts will be the 5 1/2" direction, and then cut off a 1 3/4" strip (so the piece cut off should be 1 3/4" x 5 1/2" inches). 5) Take one of the big pieces (no longer stacked) and turn it the 4 1/4" direction, then cut off 2 1/2". This should create a 4 1/4" x 2 1/2" piece and a 4 1/4" x 3" piece. Cut the later in half diagonally. 6) With the remaining large piece cut off a 1/2" strip the long way (so it will be 1/2" x 5 1/2"). I hope you've enjoyed this series! If you had fun crafting along with me leave me a comment- I'd love to hear from you :) Be sure to flutterby again soon. I'm back with another gorgeous card from my 'half' sheet wonder. To recap: I'm making 8 matching cards all cut from a half sheet of DSP. Join me each day this week to see a new card, and at the end I'll show you the template for cutting your own. Today let's talk cardstock. 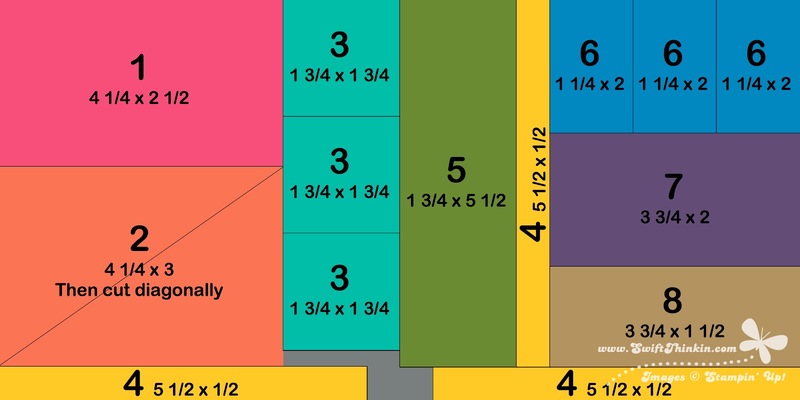 You will need 8 card bases to create these cards, which means 4 sheets of 8.5x11 cardstock (just cut it in half at the 5.5" mark). I used two sheets of Very Vanilla and one sheet each of Baked Brown Sugar and Tangerine Tango to match the DSP. Then, you will also need 4 strips of cardstock (5 1/2" x 2 1/8") to create the colored stripes on some of the cards. You can cut them from a half sheet of cardstock, or two quarter sheets as I did giving you more color variations. From one of these strips you will cut off 1/2" the long way (so it is 5.5x0.5). Use the wider stripe on the card from day 4 and the skinny stripe on today's card. Which brings us to today's feature, the card of course! Be sure to flutterby tomorrow. We have lots to talk about with the template for how to cut all these DSP blocks out! Sunday, time for relaxation, and sharing today's 'half' sheet wonder. To recap: I'm making 8 matching cards all cut from a half sheet of DSP. Join me each day this week to see a new card, and at the end I'll show you the template for cutting your own. And thank YOU for stopping by today. See you flutterby tomorrow! Isn't it wonderful that the weekend is here? I'm off and running to get ready for a birthday party for a special little boy- but first I'm here to share today's 'half' sheet wonder. To recap: I'm making 8 matching cards all cut from a half sheet of DSP. Join me each day this week to see a new card, and at the end I'll show you the template for cutting your own. I like giving my cards a little pop and bling. So I whipped out my rhinestones and Washi tape for this project. 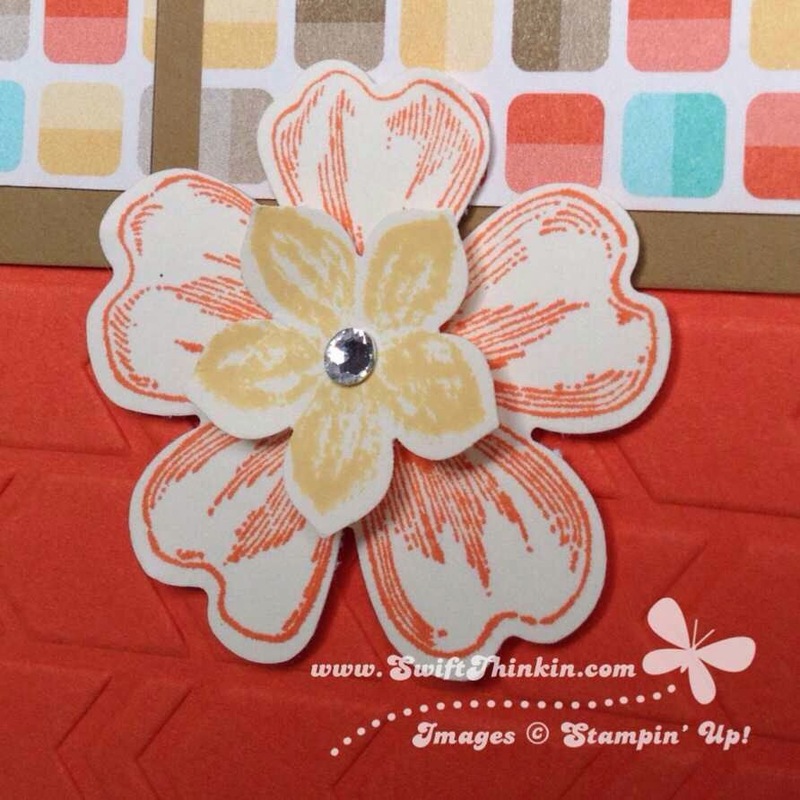 I think it is so fun when Stampin' Up! makes matching items, so you know I had to get the Retro Fresh Washi Tape to go with the DSP. Isn't it fun! If you haven't tried to washi yet you have got to get your hands on some of this tape. It is a paper tape- so you can rip it with your hands. That 'raw' edge gives it so much character :) Also, it isn't a permanent tape, so you can play with it to get it just how you want it (although be sure to use a 'real' adhesive to if you want things to stay good and tight). I just know ohhs and ahhs are ensuing :) See you when you flutterby again tomorrow! It's another beautiful day of a 'half' sheet wonder. To recap: I'm making 8 matching cards all cut from a half sheet of DSP. Join me each day this week to see a new card, and at the end I'll show you the template for cutting your own. This may be one of my favorite cards- especially since it takes some of what would otherwise be skinny scraps and makes them look A-MAZ-ING. Love it! Flutterby again tomorrow to see more. Glad you could join me again for this 'half' sheet wonder. To recap: I'm making 8 matching cards all cut from a half sheet of DSP. Join me each day this week to see a new card, and at the end I'll show you the template for cutting your own. For all my cards I used two fantastic flower stamp bundles: the Flower Shop Bundle from the annual catalog and the Petite Petals Bundle from the spring Occasions catalog. I love that these stamps come with matching punches... it makes my life SO MUCH easier (and to be honest, I'd never cut these out by hand- way to futzy work for me). And I love how these two sets look layered together. Don't they compliment each other well? Hope you love it- and flutterby again tomorrow! 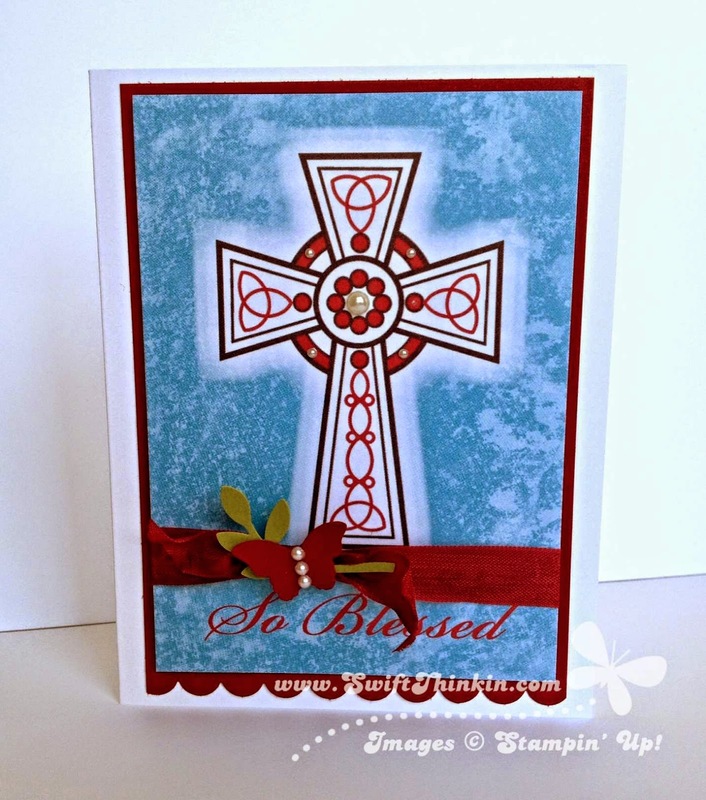 For my cards I used the Retro Fresh DSP from the spring Occasions catalog. I fell in love with the colors in this gem the first time I saw it. Costal Cabana, Baked Brown Sugar, Tangerine Tango, So Saffron, and Very Vanilla (hmm, is this a listing of colors or the recipe for a beach treat...) Yummy! If you love this paper as much as I do you better hurry- very soon the mini catalog will be done and it will be gone. Totally cute, right? Make sure you flutterby again tomorrow for some more! Have you all heard of a One Sheet Wonder? The idea behind them is to create a set of matching cards using an 8.5x11 sheet of patterend paper cut into different shapes. However, our DSP usually comes in 12x12... which leaves a lot of leftovers. So what is a girl to do? Well, redesign it of course! I took some of my favorite OSW card designs and rearranged the pieces to fit them on a 6x12 sheet of paper instead of an 8.5x11. I was able to get 8 awesome card designs out of a half sheet of DSP! Woot! Want to make a set too? Then you've come to the right place :) Over the next week I'll be sharing the cards I made, and then at the end I'll share my pattern with you too. So grab your morning coffee (or tea in my case) and stop on by each morning to see what cute design you get next! I just love these colors :) Hope you are inspired to flutterby again tomorrow. This weekend I was in need of a quick baptism card. And when I say quick I mean it was the morning of and I still had to get the kids (and myself) ready for church too! Luckily I had designed Declan's baptism thank you cards in MDS so I was able to use that as a springboard. What baby boy wouldn't love this card :) Well, okay, so a baby boy probably won't care... but a momma sure would like it! Hope this inspires you to create a hybrid card next time you are in a time crunch too.